Rose Dog is truly an eclectic gem on the island of St. Barts. It has a comfortable layout, unique design, and conveniently separate suite for anyone who wants extra privacy. 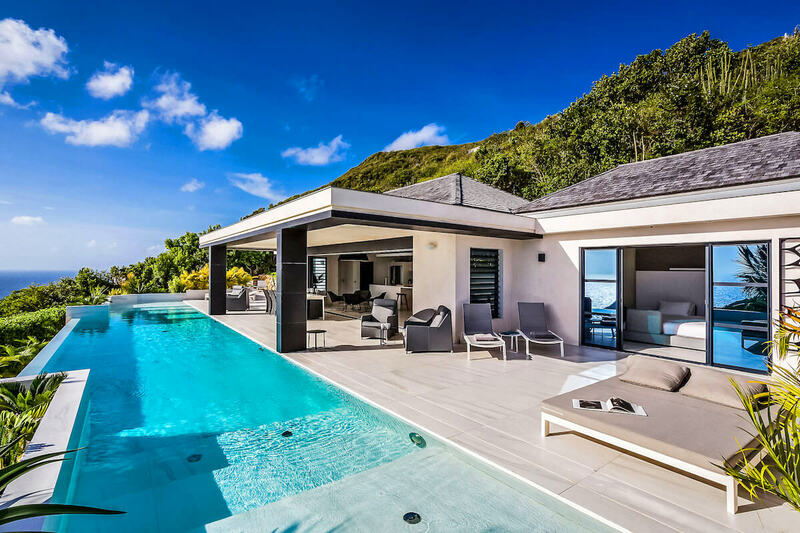 Rose Dog Villa is a contemporary, modern home that’s built into the island hillside. It enjoys ocean views, daily housekeeping, a gardener, and pool maintenance. The infinity pool borders the hillside, and has a wading area ideal for children and adults. A long deck runs along the length of the villa, and has ample seating and sun beds. There’s a small garden off to the side. Under the veranda, there’s a dining table for eight with an ocean view. A fully retractable glass door opens from the veranda to the Great Room. There’s a lounge, a gourmet kitchen, and a living area. The kitchen has stainless steel appliances, a breakfast bar, and cookware. The living area has a flatscreen TV, entertainment system, and white chaises. Quirky accents add a modern twist to the all-white interior. All four bedrooms have queen beds, an ensuite bathroom, and a flatscreen TV. Two connect to the living room, and two are in their own two-story bungalow with a private terrace and bar. One suite is on the lower level and one is on the upper level. Rose Dog is near Toiny Beach, just 10 minutes from dining and shopping. Grand Cul de Sac and Petit Cul de Sac are also within a short drive. pool size 13 ft. x 36 ft. This is a wonderful place. Our family loved it, even our charming teenagers. Shawna is amazing! She was very responsive and helpful. Category A rental car from Welcome car rental is included with any weekly rental (7 nights) during low season.